By Neelesh Moorthy on Tuesday, July 19th, 2016 at 11:34 a.m.
Once a campaign foe of Donald Trump, New Jersey Gov. Chris Christie will promote him at the Republican National Convention on Tuesday. Christie formally endorsed Trump for the Republican nomination back in February, which came as a surprise to many given Christie’s criticism of Trump when Christie was still fighting for the Republican nomination. Christie even held a news conference just to deny he was being held as Trump’s "hostage" during the endorsement. "We do not need reality TV in the Oval Office right now," he said in December at an Iowa campaign stop. "President of the United States is not a place for an entertainer." The bad blood went both ways. "I know him and I guess he used to be a friend until this all happened," Trump said 25 days before Christie’s endorsement. Trump later named Christie to his "transition team" — usually assembled to help president’s acclimate to the White House — in May. Christie was even one of the three finalists to become Trump’s vice president along with Indiana Gov. Mike Pence, who was selected, and former House Speaker Newt Gingrich. In addition to having run for the 2016 nomination, Christie serves as the second-term governor of New Jersey. He served as a United States attorney between 2002 and 2008, something he touted often during the presidential debates. We took a look at Christie’s record on the Truth-O-Meter. Of the 100 claims we’ve rated, 65 percent have been True, Mostly True or Half True. Christie announced his candidacy June 30, 2015, before suspending his bid February 10, 2016. Christie was relegated to the undercard debates during the campaign before eventually fighting his way back to the main debate stage. We rated Christie eight times during the campaign, six of which were False, Mostly False or Pants on Fire. Christie said on Jan. 15 he had not supported Sonia Sotomayor for the Supreme Court, after being attacked by Sen. Marco Rubio on this point. A look at the historical record, however, disproved Christie’s retort. We rated this claim False. During the Aug. 6 primary debate, Christie invoked his record as a U.S. attorney in fighting terrorism, saying he was appointed the day before the 9/11 attacks. The problem is, he wasn’t officially nominated until December 2001. We rated this claim Mostly False. Also controversial during the debates was the specter of "Bridgegate," where Christie was accused of knowingly creating traffic jams on a major New Jersey road. Christie has consistently denied these allegations. In an interview July 6, 2015, Christie claimed three independent investigations had acquitted him. The investigations weren’t as conclusive as Christie made them out to be, however, so we gave this claim a Half True. Christie made one Pants on Fire! claim during his candidacy when he said Bernie Sanders’ tax plan would raise taxes to 90 percent. A look at Sanders’ taxation plans, however, suggested the opposite. We’ve fact checked Christie 92 times as New Jersey governor, with a mixed record. Of those, 63 have been rated True, Mostly True or Half True. In January 2014, Christie claimed state unemployment under his watch was at its lowest in five years, which we found Mostly True. Christie claimed New Jersey had gained 143,000 private-sector jobs during his administration, and his number was on the money — True. Christie defended his decision to accept a Medicaid expansion through ObamaCare, saying it had little effect because New Jersey’s Medicaid program was already expansive. We rated the claim Mostly True. There are still some blemishes on Christie’s record, however. Christie repeatedly claimed (most recently in November 2012) he was the first governor to endorse Mitt Romney in the 2012 election. We gave this a Pants on Fire! because two others beat him to the punch. Another Pants on Fire! — contrary to what Christie claimed in 2012, President Barack Obama had in fact detailed his plan for reducing the federal budget deficit. Christie’s claim that the government was taking over health care led to another Pants on Fire! The private marketplace is still very much involved with health care insurance, even under the Affordable Care Act. Christie exaggerated his claim of convicting corrupt state officials, and his claim was rated False as a result. A claim that New Jersey job growth represented 25 percent of the nation’s job growth was also off the mark, because it compared apples to oranges. We rated this False. Christie claimed in 2012 there were fewer jobs in America than before Obama took office. We rated this Mostly False, because Christie’s claim cherry-picked the data. Prior to Christie endorsing Trump, the two traded barbs. "What are you going to do? Just go upstairs to the residence and say I’m not playing?" Christie said after Trump skipped a Republican debate. Christie also took a stance on whether Trump mocked a reporter with disabilities (we said he did). 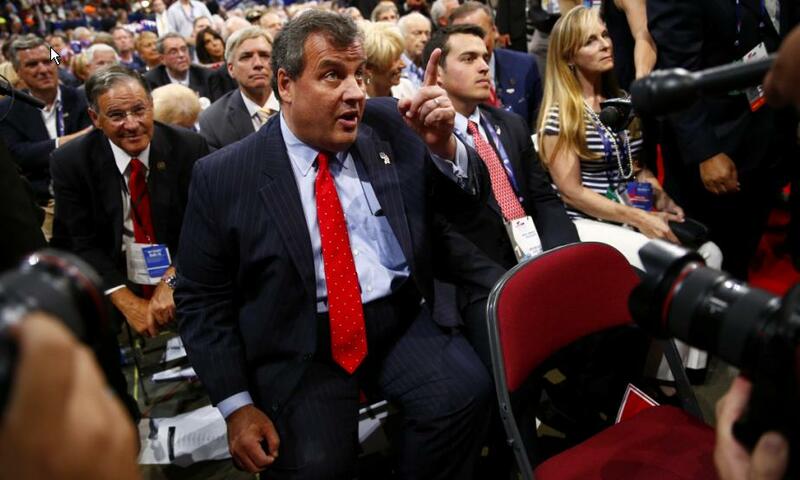 "He shouldn’t be making fun of people with disabilities," Christie said. "It’s just not worthy of someone running for the president of the United States." Trump returned fire — "he was like a little boy," Trump said about a Christie-Obama embrace after Hurricane Sandy. He took a stance on Bridegate, saying Christie knew about the road closures before they happened and that "Chris can’t win because of his past." Flash-forward to Christie’s endorsement, however, and there’s a very different dynamic. "There is no one who is better prepared to provide America with the strong leadership that it needs both at home and around the world, than Donald Trump," Christie said at the time. Christie even defended Trump from Mitt Romney, who had called Trump a "fraud." Since the endorsement, Trump returned the favor, saying Christie was "a real talent." In time for the convention, the two have apparently buried the hatchet.